One of the most important points effecting alignment of the knee during the pedaling cycle is the connection of the foot with the pedal. The cleat is indeed the component that separates the shoe from the pedal. It is here where the power generated from the lower limbs is transferred to the cranks. It is precisely here that a significant amount of power is lost due to improper alignment. Where does the wasted power go? The joints and supporting ligament and skeletal muscle groups are effectively the punching bags of this wasted energy. Signs of distress will include knee pain, foot pain and cramps in specific areas of the foot. Even if you do not have these signs and symptoms, it will be advisable to have the cleats looked at to determine if you have already have maximum efficiency. We want you to be the best cyclist you can be, you may be a professional wearing a jersey sponsored by Aviva or another big company or you could be a complete amateur. It really doesn't matter, you will still feel the same pain and will need to get it sorted. By correcting the biomechanics of the inefficient stance, the cyclist will thus be able to maximise every ounce of power that the human body is able to generate, provided also that the positioning of the cyclist is optimal. This procedure is done together with the positioning of the rider as this can influence the position of the saddle if done alone. Hence the knee alignment procedure is not offered as a separate procedure, and is now part and parcel of the Full Bike Fit. The cycling shoe must fit well. It will be very difficult to establish a good foot, shoe and pedal relationship. Cyclists with leg length discrepancies may develop knee pain as only one leg extension is correct. This leads to increased stress inside the knee and hip joints on the improperly fitted side. Pain will result usually in the shorter leg as the leg gets abnormally elongated. Pain sometimes surfaces from behind the knee. Soft tissue injuries will set in if this is overlooked. The wedge system allows for insertion onto the sole of the shoe on the shorter side of the leg. The difference in lengths can be up to 10 mm or more. This should be the first aspect to take note of and corrected by additional spacers to the shorter leg. It also does not mean that a shorter leg requires additional spacers; sometimes it’s the other way round. There are several aspects of the cleat alignment, which are explained in the next few sections. A research study by Garbalosa JC, McClure MH, Catlin PA, Wooden MJ. "The frontal plane relationship of the forefoot to the rearfoot in a asymptomatic population." Journal of Orthopaedic and Sports Physical Therapy. 1994; 20:200-206 reported that 87% of the population has a foot structure known as "forefoot varus". Forefoot varus is when the foot tilts up to the inside position. In this same study, it was found that an additional 9% of the population have another structure known as "forefoot valgus". Please click the diagram below for to view a larger image. 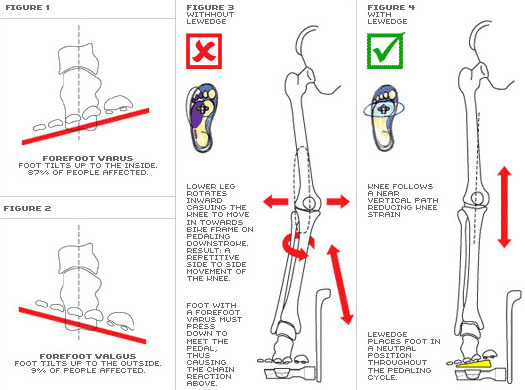 The concept behind cant wedges is to accommodate for the natural twisting of the forefoot (varus or valgus). This is normal! Due to the fact that the front of the foot is where the pedal contact is made, 96% of cyclists who clip in flat-footed are misaligned. All conventional pedal systems (with the exception of Look CX6 Ti) will require the rider to clip in flat-footed. Since the fit of any road cycling shoe is snug. The cleats will force the riders’ knee either inwards or outwards (depending on forefoot varus or valgus). Once the rider applies force downwards, the knee which is not in its natural position will feel the lateral strain and hence knee pain and/or foot pain is developed. The more severe is the pain, the more severe usually is the forefoot twist. Let’s look at foot pain. Some of us, in trying to rectify this forefoot twist discrepancy, will subconsciously lock the ankles and continue pedaling. Over time, sometimes within half an hour, the outer side of the foot will come under “pain attack” and continue to be sore for many hours after the ride. When there is a huge varus angle present, a typical sign is the cycling shoes shearing the surface of the cranks. You will observe severe scratch marks on both your shoes and on both cranks. This is due to the heel of the cycling shoe gyrating laterally and coming into contact with the cranks. Once wedges are applied and the correct alignment in place, the heel of the cycling shoe will then travel a straight vertical path. Using the forefoot measuring device, we can determine the number of wedges for insertion to correct either the varus and/or valgus associated with the forefoot. These wedges are patented and research has gone into the material to allow for consistency and reliability. During the pedal stroke, the rider’s feet should be as natural and at as straight a line with the pelvis-femur joint. Feet that are set wider or narrower than a rider’s natural stance, can diminish power output while putting strain on the knees as uneven pressure is exerted throughout the knee joint. In order to determine where the lateral position of the cleats, the location of the ball of the foot and the width of the pelvis-femur joint needs to be determined. For riders with wide pelvis-femur joint distances, spacers will have to be employed at the pedal spindle. Everyone has got to know where their ball of their foot is. In the down-stroke of the pedaling cycle, the torque generated by the legs will be transmitted via the ball of the foot to the pedal. Hence it is imperative that the ball of the foot be placed directly over the spindle of the pedal. This relationship is not cast in stone and is relative also to the length of the foot. When the foot gets longer, the rear end from the ball of the foot elongates more when compared to the front end of the foot. Cleat placement is thus also influenced by this fact. This is the last aspect and is by far not the least important. While the “keep adjusting the cleat angle until it does not hurt any longer” technique is still popular, you can minimise the risk of injury and optimise efficiency from the start with the help of a bike fitter and specialty tools like the R.A.D. (Rotational Adjustment Device) that help eliminate the guesswork. The R.A.D. is simply a free floating pedal device that attaches to the bicycle crank. This tool will assist the bike fitter to accomplish the necessary and correct alignment of the pedal cleat with respect to the riders’ naturally rotated gait. This alignment is important to help prevent rotational stresses of the riders’ knee, hip or ankle and also the premature release of the shoe from the pedal. Hence by having an experienced bike fitter access your situation, insert the necessary number of wedges to correct the forefoot tilt, you will be more efficient on every stroke. This whole procedure will be part of the Full Bike Fit and unless specially requested the cost of this procedure alone is S$250 excluding the wedges. For enquiries, please text or call Mervyn Liew at +65 9668 8934 or you can drop us a mail at mervyn@thebikebutler.com. The take home message – Get Professionally Fitted! !